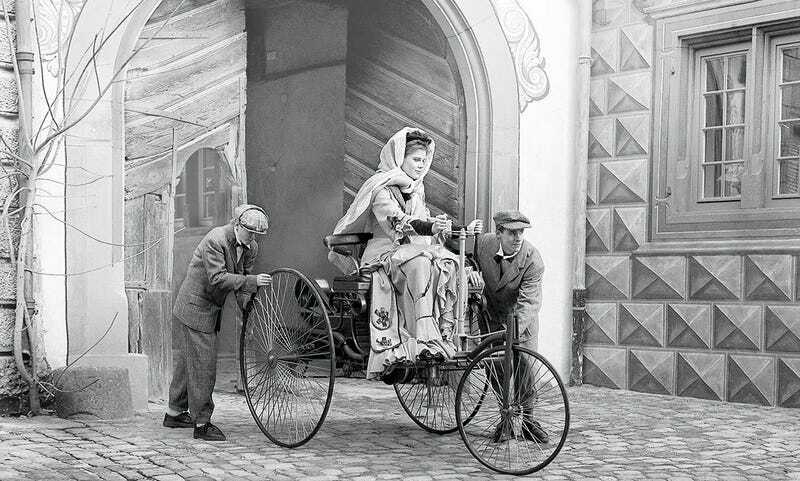 Bertha Benz, née Ringer, was born in 1849 and was the wife of famed automobile inventor Karl Benz. In 1888, she became the first person, let alone the first woman, to drive an automobile over a long distance when she and her children completed the 106 km (66 mi) drove from their home in Mannheim to Pforzheim, driving Karl's Patent Motorwagen. The stated purpose of the drive was to visit her mother, but Bertha's true intention was prove that her husband's invention would be successful if it could be shown to be useful to the general public. Both she and her husband were heavily invested in the success of Karl's automotive venture. Bertha had invested before they were married, though she lost her power to act as an investor when they were married. The drive was not without mishaps, and Bertha showed her true Jalopitude. She had to procure ligroin from an apothecary for fuel, and she had to find a blacksmith to help fix a chain. She used a hatpin to clear a clogged fuel line. When the brakes needed to be repaired, Bertha told a shoemaker to put leather on the brake block to act as a brake lining to increase stopping power. She also suggested to Karl that the automobile needed additional gears for climbing hills. These and other ideas were incorporated into future versions of the automobile. In 2008, the Bertha Benz Memorial Route was created, and modern drivers can trace her 194 km round trip from Mannheim via Heidelberg to Pforzheim and back.